A friend send me a group of colorized photos all of which started as black and white and seem to be meticulously painted. 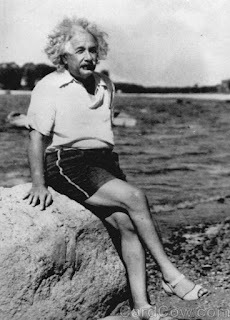 This one of Albert Einstein I found very interesting because of his fashion choice. I was not the first to note this and after some internet research I found the original photo and one other photo taken at the same time. Lots of speculation especially within our community. Here is the best comment I found on Crossdresser.com by Diane from 2010. I am a bit of a science nerd, and have seen that picture reprinted many times, over several decades. Never presented as anything other than a casual portrait of Einstein on vacation, or whatever. 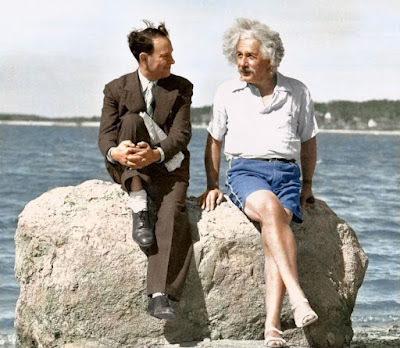 I am pretty sure from this, that it is NOT a Photoshop job (it existed long before that technology was available, and mechanically retouched pictures are much easier to detect), and also that it was fairly normal weekend attire for Einstein, who was hardly known for being either a conformist or a fashion plate. I suspect the beach sandals may have been considered more unisex than feminine at the time and in the place where that photo was taken. There are several other pictures in existence of him crossing his legs that way, so I think that was just normal and comfortable for him as well. All in all, he has always come across to me as a guy who was occupied with much more subtle and important thoughts than how his physical image would be perceived by the world, so he just did whatever was most comfortable and low-maintenance. I do remember my mother having a similar pair of shoes. Also his hair kind of looks like my wild hair. So, I guess we will never know for sure. However, if nothing else, an eclectic choice with a flair for the non-conventional. Any thoughts on your part? to be sure highly unconventional choice for men of that time and even today as they look much like women's sandals than anything else. Thanks for the comment - That is what I was hoping someone would clarify. Makes for good speculation.